. . . [the mighty sostenuto passage of Tchaikovsky's Sixth] is one of the great soul-baring moments in 19th-century symphonic music and Bychkov and the Czech Philharmonic give it the fullest intensity . . . Again playing that is infused with an in-the-moment spontaneity: no flash, just honest, musical, shapely playing . . . which builds from sprightly and festive to menacing with great panache . . . A very fine performance, then, no question, and supplemented by a "Romeo and Juliet" of similar qualities -- keen and articulate in strife, rich in romance. And it feels personal in a way that the warm, homespun playing of the Czech Philharmonic only accentuates. [Symphony no. 6]: Bychkov takes a literalist approach, dependent on the glowing timbre of his ensemble to radiate Tchaikovsky's emotional transports. The orchestral response remains excellent, alluring in the strings, and heady and opulent in the trumpets. The low bassoon at the outset invokes at once a dark odyssey and turbulent outburst that concludes with "walking pizzicati". At the close, the "ffff" marking, audibly lugubrious, heralds the end of a life's tragic journey . . . ["Romeo and Juliet"]: Once more, the warmth of the performance glows, courtesy of recording engineer Stephan Reh. At the funeral march at the symphonic poem's end, the sense of fateful doom lingers long after the fermata.
. . . the serious listener will have no trouble recognizing and appreciating the performance insights that Bychkov has brought to both compositions on this album . . .
. . . [an] outstanding recording . . .
. . . ["grand"] is the word for these performances. Semyon Bychkov and the world-class Czech Philharmonic give Tchaikovsky space and depth, and a richness of sound and ambience, without missing any of the excitement at moments of high drama. The Symphony No. 6, "Pathétique", gets a performance that eschews hysteria in favour of heartfelt lyricism.
. . . these are musically intense and illuminating readings superbly played and clearly and openly recorded . . . [Symphony no. 6]: he ebbs and flows it convincingly, ensures that details and dynamics are immaculately tailored, appreciates structure, and has the Czech Philharmonic playing for all its considerable and seasoned worth, brilliantly and beautifully. Musical values are paramount, there is also no lack of emotion and eloquence; this "Pathétique¿" is certainly compelling and illuminating . . . "Romeo and Juliet" is similarly balanced between sterling musicianship and vivid narrative. It's an account laden with incident and revealing observations . . . this is a thoroughly impressive and involving collection on its own terms and further volumes are keenly anticipated.
. . . a wonderful recording . . . a wonderful reading and I highly recommend it. Dignified, compassionate and keenly proportioned readings . . . there's absolutely no want of edge-of-seat tension or giddy spectacle in the first movement's hair-raising development. Elsewhere, the Allegro molto vivace third movement effortlessly builds to a superbly exciting culmination, while the towering finale is all the more moving for its unexaggerated flow and refusal to play to the gallery. Moreover, the delectable poise and lustrous sheen displayed by the incomparable Czech Philharmonic Orchestra will surely give great pleasure . . . Likewise, the present "Romeo and Juliet" brings another performance to savour in its enticing glow, bracing cut and thrust, and ample generosity of feeling . . . Decca's engineering is wonderfully ripe, wide-ranging and detailed to match.
. . . the impeccable preparation shows in the orchestra's beautiful and passionate playing . . . Bychkov gives a performance of "Romeo and Juliet" that generates an intense passion such as I could scarcely imagine being surpassed. The sense of mystery in the opening section is remarkable, yet Bychkov keeps the music flowing with assurance . . . the combination of strings and brass could have been made in heaven. Under Bychkov's accomplished baton it is hard to imagine this glorious music being played any better . . . [Symphony no. 6]: beautifully proportioned . . . stylish and highly engaging playing . . . there is a gloriously temperamental power which erupts into action at point 9.20 . . . Strikingly, amid the heightened tension of the performance there is a distinct undertow of mystery. From start to finish the judiciously paced Allegro con grazia flows buoyantly with all the dreamlike elegance of a Viennese waltz . . . The way Bychkov builds up the orchestral weight and volume is compelling and highly dramatic . . . Bychkov and his Czech Philharmonic players obtain an array of emotions that can leave the listener crushed . . . This new release from the Czech Philharmonic under Bychkov is a stunning reading full of beauty and intense passion and can stand comfortably alongside the catalogue's greatest . . . Bychkov and the Czech Philharmonic are in breathtaking form and this first volume of "The Tchaikovsky Project" on Decca augurs remarkably well for its future releases. These are nice performances. The Czech Philharmonic plays beautifully; the sonics are warm and well balanced. Bychkov has some good ideas: the relatively swift first movement introduction, for example, or the characterful phrasing at the start of the recapitulation. The watchword is elegance . . .
. . . [this recording] is so impressive as to render the distinction between technique and imagination irrelevant . . . [Bychkov's approach seeks to give us a sense of the whole man Tchaikovsky,] who, in his last months, was becoming more and more aware of his impending mortality . 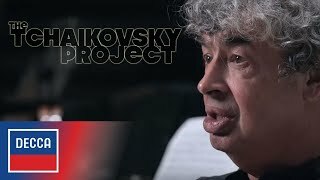 . . Whatever the work's connection to the composer's death, Bychkov views its mood as one of protest, not resignation. But Bychkov's strategy is not to give the "Pathétique" an extra dose of anger. Instead, he employs accuracy of execution as a pathway for a clearer perspective on the work's complexity . . . [we] get a heightened sense of conversation among the work's contrasting ideas, a welcome diversion from routine . . . Bychkov, helped by a fresh and open recording acoustic, does a wonderful job of treating the orchestra's different instrumental departments as equal colleagues, bringing distinctive gifts to a common effort. Clarity of articulation is key to the conductor's approach . . . Commenting on the "Romeo and Juliet" Overture-Fantasy (which also gets a winning recording here), Bychkov reminds us of Tchaikovsky's overlooked genius as a "deeply polyphonic composer", not just as a master of sumptuous melody and orchestration. This deeply personal disk amplifies that concept, giving us a multidimensional view of the composer's greatest symphony. From the start, Bychkov's "Pathetique" conveys the sense that you're back in a place you know well yet have never been before. The clarity with which the score is revealed is remarkable, but such sonic lucidity -- pretty much the "sine qua non" of good recordings now -- can, in many other hands, substitute for interpretation or, more to the point, feeling. Bychkov's view of the work is less an interpretation than a vision, multifaceted but whole, direct yet dreamlike. Scarcely has the opening bassoon solo begun, over a cushion of barely audible low strings, you know you're in the realm of tragedy, not sadness. This is a bassoon that thinks you better be alarmed at its song, a threnody that never wholly leaves the room, even when the dancing gets furious . . . It's not that, as a listener, you're dancing, desperately, as fast as you can, or that you ever worry that there's going to be an accident in the pit; the fear is that in the sheer centrifugal force, your head might blow off. The relative understatement of the final Adagio lamentoso reflects the sense of almost disbelieving relief that you did not reel into the inferno. That may all sound overwrought, but I've never felt this piece take possession of me in quite the same way, and now I won't settle for less. The playing is magnificent . . . Bychkov proves a sympathetic advocate for the composer. Dynamically speaking, there is an appreciable flexibility of pulse and the quieter sections are especially beautiful . . . The third movement is a high point of this performance. A nice "bite" to the sound along with some stunning ensemble work makes a lasting impression . . . ["Romeo and Juliet"]: The playing remains superlative . . .
That the "Pathetique" is Tchaikovsky's greatest symphony becomes apparent when you hear a good rendering. This beautiful new recording made in Prague by the Czech Philharmonic, under Russian conductor Semyon Bychkov, has everything going for it. The playing is subtly flexible, the acoustic of the Dvorak Hall in the Rudolfinum lets the instrumental timbres expand and glow and Bychkov knows how to pace each movement. For a modern version, this takes some beating. The playing is magnificent. The various sections of the orchestra still seem to hold a distinctive sound, and Bychkov proves a sympathetic advocate for the composer. Dynamically speaking, there is an appreciable flexibility of pulse and the quieter sections are especially beautiful . . . The orchestral picture is magnificent . . . there is a certain joy in having the Czech Philharmonic Orchestra in this music . . . [Bychkov] does prove sympathetic, particularly in quieter sections where he coaxes some lovely playing. The second movement waltz is very beautiful . . . There are some nice touches dynamically, and the playing is without peer. The third movement is a high point of this performance. A nice "bite" to the sound along with some stunning ensemble work makes a lasting impression . . . wonderful playing throughout . . . [when Bychov completes this series] we'll have a nicely recorded and technically brilliant cycle with one of the world's great orchestras.
. . . here we have a "Pathetique" which flows like a river and pounces like a cat . . . The orchestra sounds velvety and spacious . . . and Tchaikovsky's last symphony sleekly colorful and feline . . . [Bychkov] has a way of moving forward smoothly and avoiding static moments in anything he conducts . . . This "Pathetique" propels easily and gleams like Schumann . . . There is plenty of excitement . . . Bychkov's "Romeo and Juliet" is delivered in cat's paw manner -- extremely beautiful, rather swift, never raw or hysterical . . . The playing here is admirably clean . . . the more I listen, the more I like this coupling.
. . . [Bychkov] weiß um die Tiefen der slawischen Seele und hat auch keine Scheu vor großen Emotionen, für die ihm die Tschechische Philharmonie den idealen Klang liefert. Keineswegs aber versteht er diese Musik als formloses Gebilde, und genau diese perfekte Mischung aus Intellekt und Gefühl macht seine Aufnahme so außerordentlich.
. . . le nouvel enregistrement de Semyon Bychkov est la première pierre -- très prometteuse -- d'une intégrale commencant par la fin . . . sans redéfinir les carcans interprétatifs du chef-d'¿uvre de Tchaikovski, nous avons bien entre les mains une excellente nouvelle proposition . . . avec une maturité plus évidente et moins de fébrilité, surtout dans l'Adagio . . . un son caractérisé et possède toujours une véritable personnalité, mélange de timbres bruts de l'Est et de lyrisme Occidental, idéal pour aborder le compositeur dans toute sa diversité . . . l'Ouverture Symphonique "Roméo et Juliette" attire par son caractère extrêmement tranquille et doucereux, dans lequel les contrepoints des cuivres prennent une place particulière . . . la dynamique reste mesurée et Bychkov maintient l'orchestre dans une absolue sérénité, peut-être quelque peu au détriment du caractère dramaturgique de la pièce . . . [un] très beau premier CD, espérons en découvrir rapidement plus . . .
. . . [Tchaikovsky / Symphony no. 6]: il a égalisé l'humeur, balayé certaines condescendances et fluidifié la plupart des tempos . . . Les pupitres sont équilibrés . . . une méticuleuse lecture orchestrale . . . Statu quo dans "Roméo et Juliette", remarquablement décortiqué, domestiqué et balancé . . .